Mechanical Fuel Pumps Free Flow Rate: 80 gph Maximum Pressure (psi): 8 psi Inlet Attachment: Female threads Inlet Size: 1/4 in. NPT Inlet Quantity: Single Outlet Attachment: Female threads Outlet Size: 1/4 in. NPT Outlet Quantity: Single Quantity: Sold individually. Notes: Fittings not included. Fuel Pump, Mechanical, Chevy, Small Block, Each * Check to make sure this part fits your application An affordable pump that delivers. 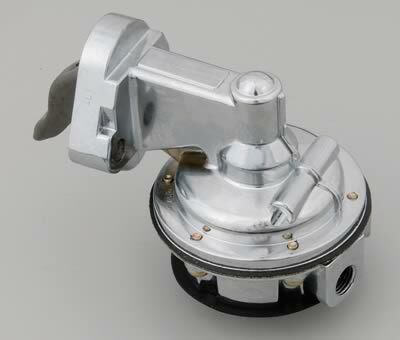 The mechanical fuel pumps are available in two versions; one has ¼ in. NPT inlets and outlets, provides 5.7 to 8 psi, and can free-flow 80 gph. That's twice what a normal pump delivers. These pumps are triple chrome plated for good looks and corrosion resistance, and the lower housings of both can be rotated through 360 degrees, to make fitting into tight places a snap.